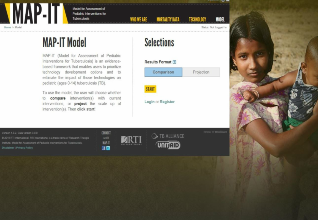 MAP-IT (Model for Assessment of Pediatric Interventions for Tuberculosis) model is a user-friendly, web-based tool that estimates the potential of expanded existing and new pediatric TB interventions to prevent children from contracting pediatric tuberculosis (TB) and to reduce mortality. Users can assess the impact on incidence and mortality for changes in a technology’s availability, use, or efficacy to understand the potential impact of various interventions. It also allows users to package interventions for simultaneous dissemination to see the impact of intervention synergies. Users can set their own parameters to assess comparative impact of intervention options. Citations and references are included for full transparency on the sources of data and assumptions. 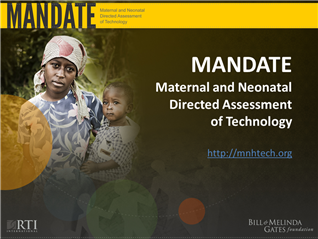 MAP-IT is built using the same methods as the MANDATE (Maternal and Neonatal Directed Assessment of Technologies) model. The same steps used for MANDATE online model can be used to navigate the MAP-IT model. This presentation will demonstrate how to use the MANDATE model.